How to change an email on facebook and delete old one: Let's get started with how you can hover about Facebook to change your email and delete the old one. If peradventure you can't access the old email address or have signed up a brand-new one and wish to use it in accessing Facebook, you can change it. You can change your old email address that is associated with your account through the service's Settings menu. You're expected to log into that email and click the "link" to confirm that you want this email added to your Facebook account. Here're the steps you can follow to add an email to your Facebook account. 3. Next, choose Contact in the General tab. 4. Click Add another email or mobile number to add a new email to your account. 5. Click Add or Save Changes. According to the Facebook Help Center, you will need to re-enter your Facebook password and then click Submit before a new email is added to your account. To remove an old email address that is associated with your account, you'll need to click Remove instead of add another email or mobile number in step 4 above. A primary email address is an email you want Facebook to use when it needs to contact you and that you can use to log on to the site. To choose that primary email address which you be using in accessing Facebook, use the select buttons to select one of your email addresses that if you've multiple email addresses on your account. When you have finished making changes, click "Save Changes." Bear in mind that you can click "Cancel" peradventure you make a mistake. 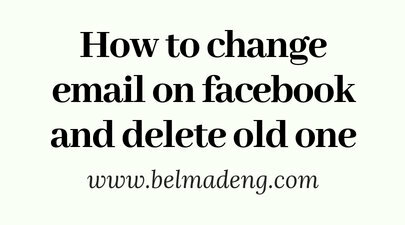 That is "How to change email on facebook and delete old one."